Josh Elliott, Passing Clouds, Radersburg, Oil on Panel, 18" x 54"
Josh Elliott is 33 years old, but in the best tradition of good artists—or anyone whose job requires continual growth—he remains an avid student of his craft. 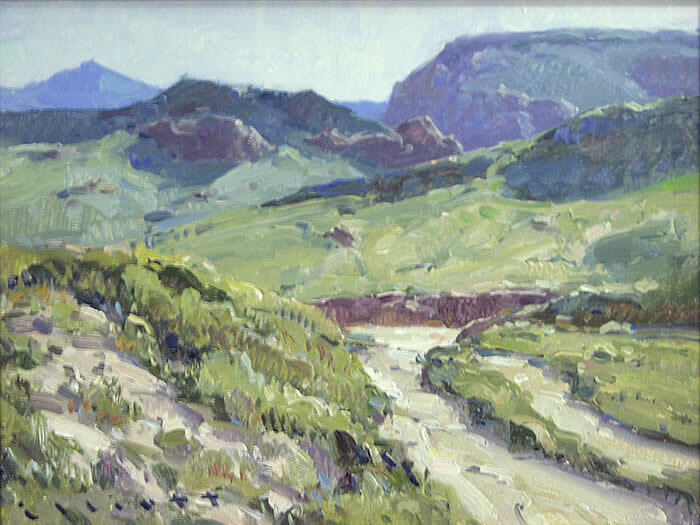 Many of his plein air outings involve experiments with design, color, or invention. Elliott already has enormous facility—one friend of his, an established artist who sells paintings for tens of thousands of dollars, saw a recent Elliott piece and jokingly muttered, “Somebody needs to break his hands.” Elliott is done with simply capturing picturesque scenes—“I’m not driven by subject matter anymore,” the painter states. Now he hopes his pieces have the allure of a rug. Yes, a rug. “All the colors come together so well in a beautiful Persian rug,” says Elliott. “I want to paint a painting that’s like one of those rugs, or like a tapestry. I’ve been more carefully designing my compositions for colors and values, going not for a focal point but rather for an overall feeling. These paintings are very thought out and planned.” He’s using his brain as much as, or more than, many painters, but one senses that Elliott is suspicious of the highbrow. “I don’t see art as an elevated thing,” he says. “It should not exclude. When people around here say they feel they don’t understand a piece, really what they’re saying is they don’t like it. 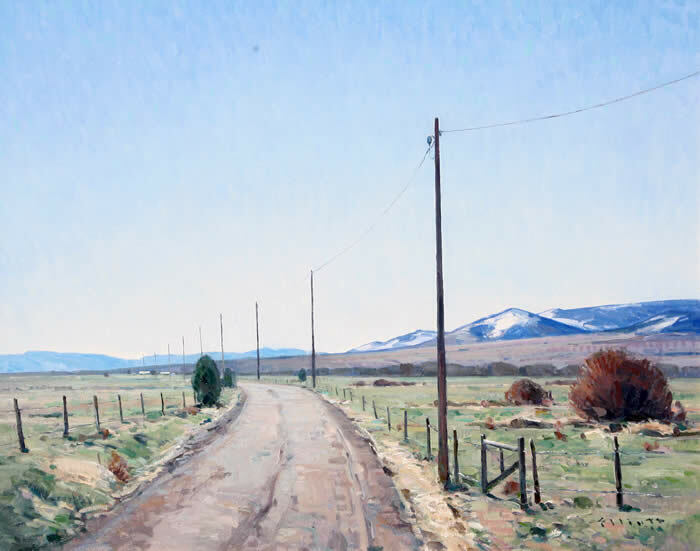 I respect that—you like what you like.” He considers his process a “blue-collar approach,” and although the oil painter’s depictions of the mountain meadows, river canyons, and working farms of his native Montana are decidedly no-nonsense, they are also thoughtful and pretty. Like a tapestry or an artful rug. Josh Elliott, Las Golondrinas Church, Oil on Panel, 24" x 20"
Josh Elliott, Rio Grande Spring, Oil on Board, 36" x 36"
This exploration is indicative of Elliott’s willingness to pursue change—be it in subject matter, composition, or the colors on his palette. 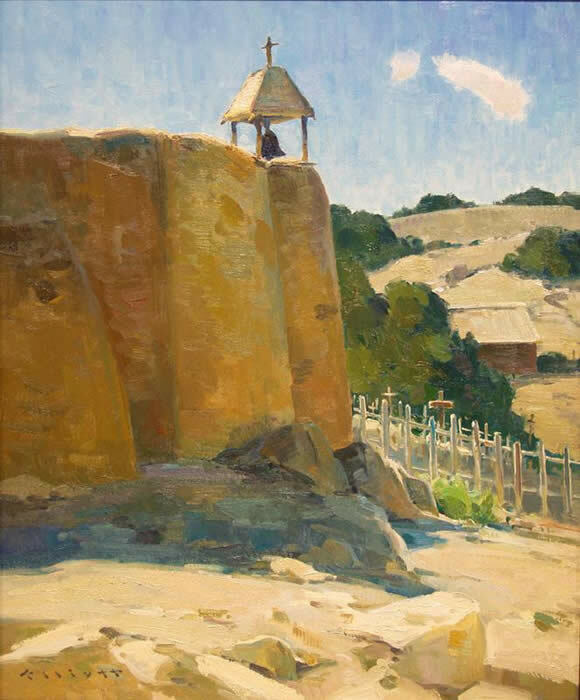 His paintings of landscapes suggest great veracity, but the artist has no problem rearranging elements to create stronger compositions. He cites the work of Victor Higgins, Rockwell Kent, and the Group of Seven—the Canadian landscape painters Franklin Carmichael, Lawren Harris, A.Y. Jackson, Frank Johnston, Arthur Lismer, J.E.H. MacDonald, and Frederick Varley—as inspirational in this regard. “They were all artists who really owned their images,” says Elliott. “They were not slaves to nature. It takes some courage to move things around, and it also takes awhile to know how to make it work.” Thus, trees can be moved and turned orange in his paintings if the artist thinks it will improve a piece. Josh Elliott, Desert Wash, Oil on Panel, 9 " x 12 "
He’s not loyal to any particular brand of paint or brush, but he favors big brushes in general—sizes 6 through 12—and uses a coarse hog’s-bristle brush for his first thin wash, which he lays in as a road map for the painting. 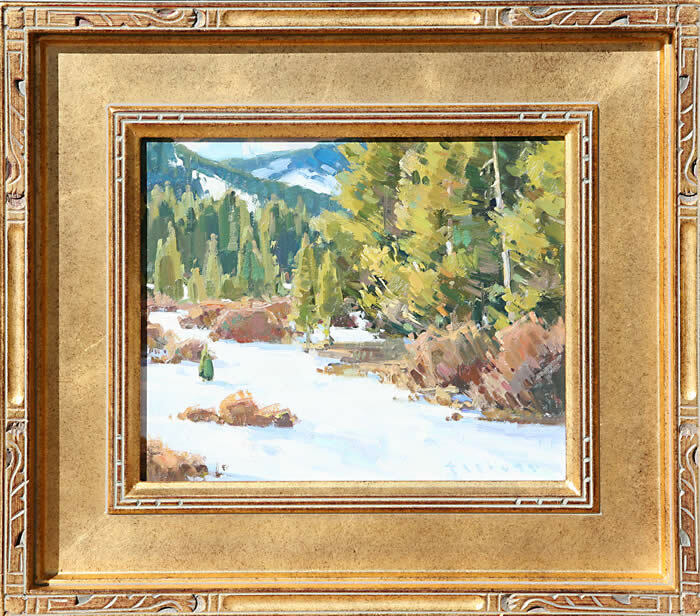 After sketching the composition in, using thinned oil paint as if it were watercolor, he switches to a smoother synthetic brush for thicker paint application. “Sometimes I let the wash show through, and sometimes I cover it all up with opaque paint,” explains Elliott. He may start with middle values, but the artist estimates that 70 percent of the time he begins by laying in his darkest darks. He then moves on to the middle values and, finally, the highlights. The artist likes to start with the area of the composition that excites him the most, and he finishes each section as he goes. “I usually block in with intense colors—I can always mute them,” he says. “I try to maintain big shapes from the beginning because those are what will allow the painting to read from 50 feet away. 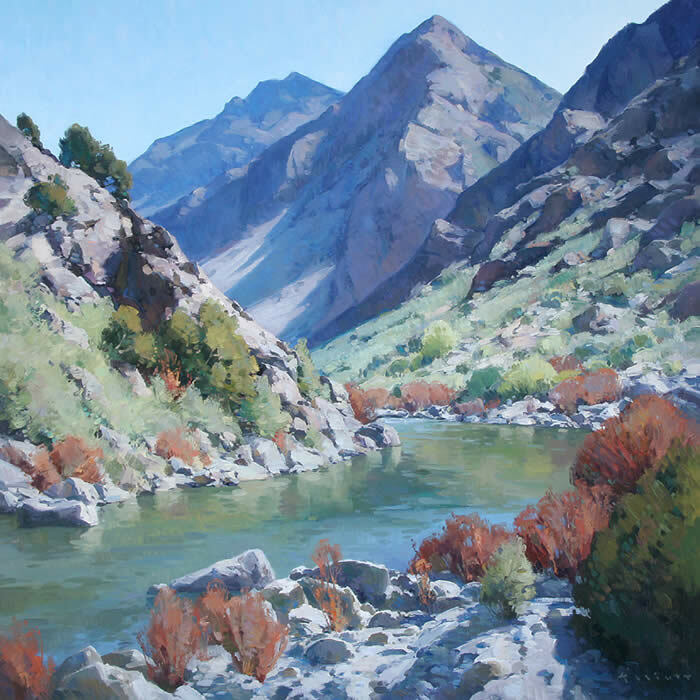 Because I finish as I go, I try to keep my brushstrokes as suggestive as possible all the way through.” This approach is readily apparent in Elliott’s depictions of scree fields, logs, and, especially, water. Josh Elliott, Montana Spring, Oil on Panel, 24" x 30"
Josh Elliott, Spring, Oil on Panel, 10" x 12"